There are a few situations that can cause a communications problem. If the problem first occurs after installing Pocket Genealogist, make sure that Pocket Genealogist was installed on the device. (Look under "Start", "Programs") If it is not there, check to make sure you have the proper download for your device. (There are multiple PocketPC downloads. All will install properly on the desktop but won't install on the device if you get the wrong version) Click HERE to go to the download area. If Pocket Genealogist IS on the device, then check to make sure that the version matches what is on the desktop. Do a "File", "About" on the device, and an "About" on the desktop to get the version of Pocket Genealogist. You should make sure you have the most current Windows Mobile Device Center as some versions of Vista (and possibly Windows 7) came with an incomplete version. Additionally, if you have a PocketPC 2002 device (sorry, older devices won't work) you cannot synchronize to the device in the 'normal' manner. Click HERE for information on how to resolve. If you don't "allow", the connection will fail and you will receive a 10054 error code. 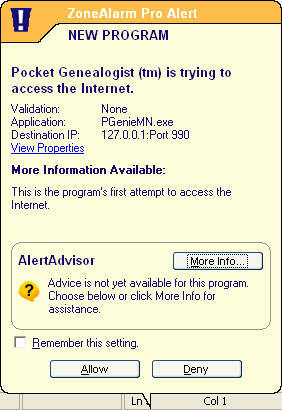 You may not see any prompts with your firewall program when Pocket Genealogist tries to communicate with the device. One way to determine if the firewall program is the issue with communications would be to temporarily disable the firewall. If you can then synchronize, the issue is definitely a firewall configuration issue. Following are some examples on possible ways to configure your firewall software.